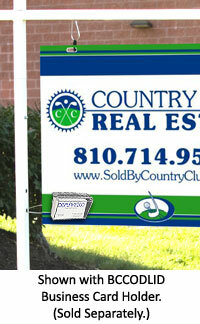 These colonial real estate sign posts are an ideal way to advertise contractor services or other business signs. 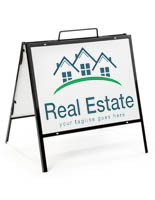 Manufactured from metal with a white finish, these real estate signs are perfect for use outdoors in front of any home or business. 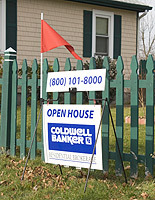 These real estate sign post, also known as "colonial style" stand, is the most attractive way to display your signs. 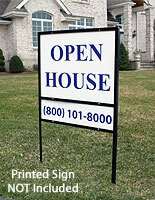 These real estate displays can be used to advertise "for rent", "open house" and "show room" signs. 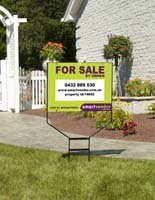 The real estate signs, such as realtor stands or lawn signs, are the most popular advertising displays used amongst businesses and real estate agencies. 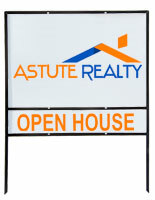 These display stands, real estate signs feature two different ways to hang your signs securely. 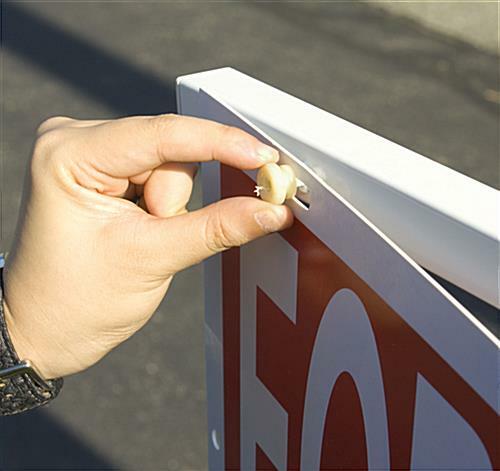 We provide the real estate signs with two knobs to tighten the sign to the stand and 3 hooks from which you can hang your signs. 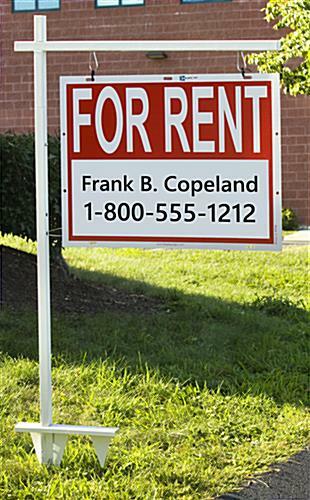 We also supply the real estate signs with the required hardware for assembly. 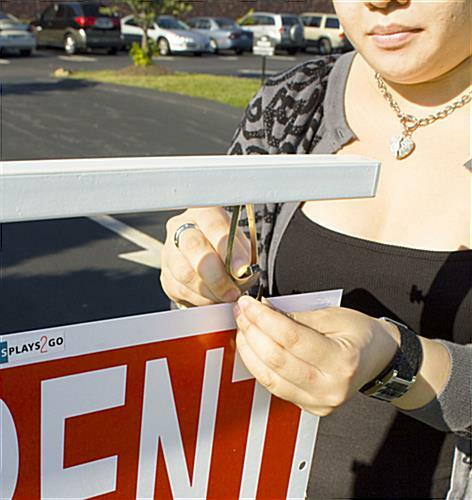 These realtor signs are shipped unassembled, but take less than 5 minutes to set up. 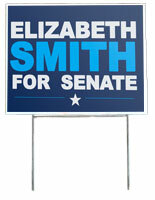 Use these lawn signs to attract the attention of passersby! 28.8" x 55.5" x 1.0"
This is a good sign post. A little short but good. I would change out the hangers for eye hole ones but other than that I like it. Thank you for taking the time to write this review, Oakley! We're glad that you like your new sign post, and we appreciate you sharing your feedback about the hanging mechanism. 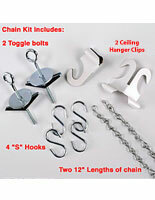 We'll certainly forward your suggestion along to our product development for review. Thanks again! 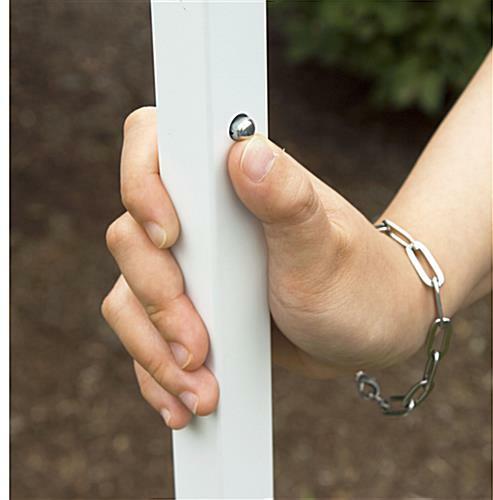 The Post is a good solution if you are looking for something not expensive and sturdy. It is a little small and I had to add an extra piece of metal (a towel rack from Home Depot) to make it at least 4 FT tall because the height was too low. My suggestion for Display 2 Go is to add an extra piece that can be purchased if you need it taller. Other than this is a good product. We are happy to hear that you like the overall product and are encouraged by your ingenuity to alter the product better for your needs. However, we take your feedback seriously and will certainly be passing on your information to our product designers. Insight like yours helps us to continue to improve on our designs and we value your thoughts tremendously. Ordered sign holders not only were they heavy duty.The price was great and the shipping fast.I will be placing many more orders. Your yard sign looks AWESOME, Dawn! Thanks so much for sharing! Maybe good for a open house sign. 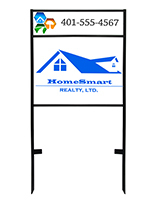 My fault in this, is that I ordered without dbl checking the height (needs to be a foot or two taller), it's useless as a yard sign post. Maybe good if you have an open house, which is what I will use it for. Hi Wayne, We're sorry this product didn't suit your needs. One of our customer care specialists will reach out to see how we can assist. Thank you! 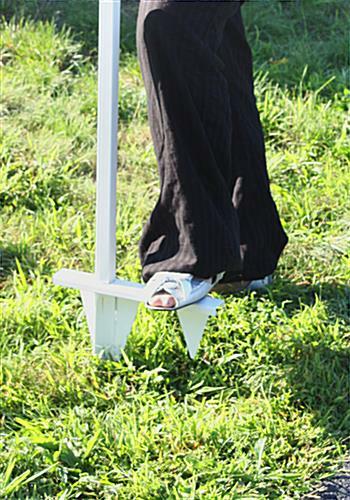 The sign posts are extremely sturdy and well-made. Some arrived with some scratches but otherwise, they are exactly what we were looking for!